The trails at Bradbury Mountain State Park include a lot of moderately difficult singletracks, some impossibly difficult singletracks and many miles of really fun purpose built mountain bike trails. The trails can be muddy early in the year but they dry out by late spring. The most difficult trails are in the western half of the park and include Boundary Trail which is almost impossible to ride. Most of the other trails leading up and down Bradbury Mountain are more manageable and are quite enjoyable. After you get to the summit be sure to ride Krista's as a downhill. Although it is fun in both directions. Switchback is a technically challenging downhill trail with lots of corners and obstacles. The Tote Road is a fun ride, challenging in a few spots, riding it in the counterclockwise direction makes it mostly an uphill. The eastern half of the park is entirely different. It's pretty flat. A lot of work has been done over the years to create an outstanding series of long singletrack mountain bike trails. Many of these are signed as "Proudly Sponsored By //////" And those sponsors should be proud. Island, Lanzo the Fox Trails, Ragan and Ginn are all don't miss, write home to mother about trails. For a more technical singletrack do the "O" trail. When you ride Bradbury you'll find numbers at each intersection. These numbers correspond to the numbers on the map. But, there are also signposts with location maps at most of these same intersections so pulling your map out of your pocket may not even be necessary. While all of these 'eastern' trails are fun to ride in both directions, I'd suggest doing the Island Trail in a clockwise direction. That will maximize the downhill. Bradbury is a wonderful palce to ride, and to explore. And, as you'll see below, there's a lot that's been going on there. When I was a kid, riding in the family station wagon along Route 95 in the Freeport, Maine area I was often puzzled to read the sign directing visitors off the highway to Bradbury Mountain State Park. "Mountain? There aren't any mountains around here!" Curiously, similar road signs directed visitors to the Desert of Maine - "Desert of Maine - who are they trying to fool?!" I decided these were attractions best suited for the uninitiated - the " Jellystone Park tourist set" and certainly not intended for seasoned Maine natives. Indeed, however, the small town of Pownal, Maine, which lies just west and north of the bustling streets of Freeport boasts two geologic attractions - the sand dunes of the "Desert of Maine" created by the shifting sands of glacial outwash, and Bradbury "Mountain" - a bald peak scoured clean by the last passing glacier with a steep southeast face, known in geologic parlance as a roche moutonée. Summiting at less than 500 feet above sea level, my instincts were right, Bradbury Mountain isn't a mountain by most people's standards, yet it is a significant highland in the coastal area north of Portland which provides panoramic views extending to Casco Bay approximately 7 miles to the southeast. According to Park Manager Mick Rogers, who assumed management duties of the park in 1994, mountain bikers make up 25 to 30 percent of his 80,000 year-round visitors. Unlike most state parks, Mick says summer is Bradbury's slowest season - the park does not include any water bodies for swimming or fishing, so isn't attractive to the beach-going crowd in the heat of summer. That means Mick can spend more of his staff resources planning, building and maintaining trail in the summer months, when the trails are dry and the most frequent visitors are mountain bikers visiting for one of 2 or 3 weekly evening rides. The park is busiest in the spring and fall, when hikers and bikers are getting their season started. Fall brings the added dimension of hunters in the park (though they are not allowed on the mountain) - remember to wear orange when biking through the park in the fall; and winter brings snowmobilers, snow-shoers and lots of cross-country skiers. I haven't yet winter biked at Bradbury, but something tells me it would be a treat! Mountain or not, Bradbury Mountain's unique geologic and topographical setting, coupled with focused stewardship on the part of the Maine Bureau of Parks and Lands Staffers has turned out to be a boon to mountain bikers who pilgrimage to the park to take advantage of the 14 miles of beginner, intermediate and technical trails that have been constructed with shared-use in mind. 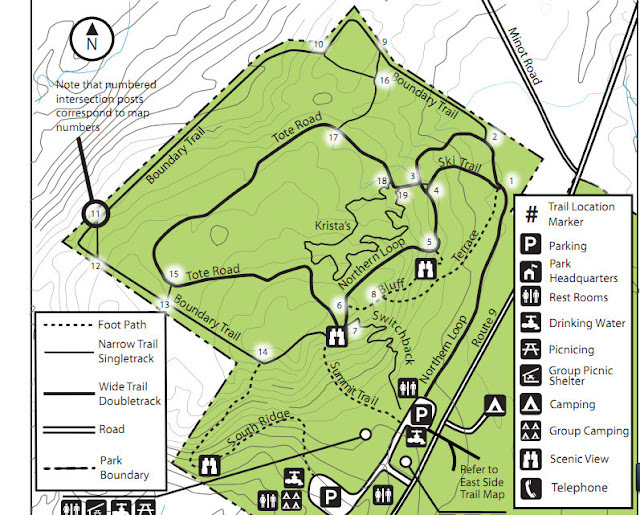 The park lies on both the west and east sides of Route 9: on the west side, the "Boundary Trail" is the most challenging of the trails in the park, ascending the north and west faces of the mountain, rising to the 485 ft summit. The Northern Loop and Tote Road Trails provide an easier climb up to the summit from the east face. Trails along the southeast face of the peak are steep and open only to hikers. The shared-use trails on the east side of Route 9 are generally beginner to intermediate trails including the Link Trail, Knight Woods Trail and a snowmobile trail that are all open to mountain bikers. Of the 9 miles of trails that exist on the east side of the road, 6 miles can be considered singletrack, as they see little use by hikers or equestrians. Mountain bikers were already visiting the park when Mick arrived in 1994, although mountain bike use was not officially sanctioned at the park at that time. The park looked to transform its trails to a shared-use trail system after being approached, ironically, by local equestrians who wanted to use the park. It was an idea worth exploring, and the timing couldn't have been better. The efforts of the equestrians worked in favor of the mountain bikers; according to Mick, there isn't currently enough trail mileage in the park to make it worth the while of most horse riders - that could change in the near future, but in the meanwhile, mountain bikers have certainly benefited from the equestrians' efforts. In the early 1990s the Maine State Legislature realized that the Bureau of Parks and Lands was a significant cultural resource and tourist attraction of the state; and that the Parks needed their own revenue source for necessary maintenance and enhancements. In 1993 the Loon Conservation License Plate was introduced to secure this revenue. The Loon Plate costs an additional $15 when you register your car, and the revenues are dedicated to fund infrastructure maintenance in state parks and support the resource conservation efforts of the Inland Fisheries and Wildlife (IFW) Department. In 2002 the Loon Plate fees generated nearly $670,000 for the Department of Conservation (which includes the Bureau of Parks and Lands) and almost $450,000 for IFW. Since the plate's inception, more than $7 million has been invested by the Department of Conservation's Bureau of Parks and Lands and the Department of Inland Fisheries and Wildlife. With the motivation to create the first shared-use trails in a southern Maine State Park, and the availability of resources through the Loon Plate revenues, in 1994 Mick Rogers embarked on a mission to improve the existing trail system and expand upon it to provide access to a variety of users. The Loon Plate was an immediate success, because many Mainers did not care for the aesthetics of the then-standard Lobster License Plate. However, when, a few years ago the attractive Chickadee license plate was introduced to replace the Lobster Plate, sales of the Loon Plate dropped off significantly. Mick emphasizes the benefits to the parks the revenue from the Loon Plate offers, and encourages park users who wish to see the parks and riding opportunities expand, to support trail construction and enhancement by buying the Loon Conservation Plate. The funds generated by the Loon Plate have been used as matching funds to the State's Recreational Trail Grant (RTG) Program to allow Mick and his staff to evaluate trail use, drainage and assess the need for improvements, including the construction of bridges capable of supporting horse and rider, snowmobiles as well as mountain bikers. "Before I came here, there were no bridges at all," says Mick. "We've spent a lot of time evaluating how water drains off the mountain and designing and reconstructing trails to accommodate those drainage patterns - at first a lot of it was trial and error." This year, the Park received over $8,000 from the RTG Program to continue its trail building and maintenance efforts. In addition to the funds available through State channels, the expansion of the park and riding opportunities have been bolstered by the efforts of the Pownal Land Trust, a group of local individuals who formed circa 1990 to capitalize on an opportunity to expand Bradbury Park to the east. The group formed as a non-profit organization and obtained funds through a state bond proposal to purchase a wooded section of Knight Farm, a farm located near the southeast portion of the park. The Knight Woods Trail is a popular shared-use trail used by mountain bikers - the trail wouldn't exist without the efforts of the PLT nearly 15 years ago - but this was only the beginning. After the success of the Knight Woods parcel, the momentum within the group lapsed somewhat until the threat of subdivision of the Knight Farm reared its ugly head. The proposal on the table was to subdivide the farm into three lots; the reenergized group sought a Revolving Loan from the Maine Coast Heritage Trust to purchase the farm outright. With the funds secure, the PLT placed a conservation easement on the parcel preventing any subdivision, then resold the farm as a single parcel, ensuring its future as an agricultural homestead. The classic New England Farm is a visible landmark from the summit of Bradbury Mountain. Phase III of the PLT's efforts is their largest effort to date. In 2001 the group launched a mission to connect the trails and lands of Bradbury State Park (an estimated 700+ acres) to the 600+ acres of the Pineland Public Reserve Lands (Pineland Reserve) located in Gray, North Yarmouth and New Gloucester, located about 4 miles west of Bradbury State Park. Access to the Pinelands Reserve is via a trail head on Route 231. Owing to the proximity of the Pineland Reserve, and the similar recreational missions of both Pineland Reserve and Bradbury, the connection of the two places by a shared-use trail and wildlife corridor seemed the natural next step for the PLT. The PLT was successful at receiving a grant in the amount of $840,000 from the Land for Maine's Future Bond program and has been working with local land owners to secure easements and acquire land along the proposed corridor. Currently the 3 miles of trails that exist at the Pineland Reserve are open to pedestrians only. Two hiking loops exist on the Pineland Reserve: a 1.7 mile loop along the east bank of the Royal River, and a 1.3 mile loop through the adjacent woodlands. Currently these trails are not open to mountain bikers, but Mick's long range plan is to extend the shared use trails from Bradbury to the Pineland Reserve and to upgrade the existing trails in the Pineland Public Reserve Lands to allow for shared-use. According to Mick, the corridor connecting Bradbury to Pineland Reserve will primarily serve mountain bikers, hikers and equestrians; the corridor will be off-limits to ATV users. Alix Hopkins, long associated with conservation efforts in Southern Maine, has worked diligently with her colleagues at the PLT to acquire the funds, obtain easements and generate public support for the project. In general, the project has been well received by community members, however some residents are concerned that the land remains open to traditional uses like hunting and snowmobiling, while others are concerned about the loss of tax base revenues to the community, and still others are concerned about the influx of visitors to the park, located near the town center. From a focused position of collaboration with all users, Alix expects completion of the land acquisition phase of the project by 2007. With that phase over, Alix envisions that the PLT will continue to work with Park Management and staff to design and maintain trails, and plans to create a committee of stakeholders to direct and understand current uses and needs, and to assess how to accommodate those uses and needs among the variety of trail users. The park does not currently have a "Friends of the Park" type organization, which are very active in some parks, to help with planning and fundraising. For his part, Mick Rogers looks to the volunteer efforts of local citizens and trail users to aid in the management and direction of the expanded park. With the acquisitions envisioned by PLT, Mick's long term concern is how to manage a significant increase in land with the same budget and personnel resources he has now. Groups like the stakeholder committee will be useful in long term planning and direction, but Mick plans the construction of 20 to 30 miles of additional shared use trail (doubling the 14 miles that currently exist) on the newly acquired land - [some trails and old woods roads currently exist on the expansion parcels that can be enhanced and improved for shared-use purposes]. Mick expects that with the enhanced trail mileage, and the connection of the State Park to the Pineland Reserve, increased use of the trails by equestrians will result. The funding of this proposed trail building work will likely come from revenues from the Loon Plate program and RTG program. These programs will fund equipment, materials and supplies for trail work, bridge materials, and gravel for new trails and existing trail improvement, but he will rely on volunteer labor from user groups and community members to meet the RTG match requirements. Mick has established an excellent relationship with the mountain bikers who visit his park. He is enthusiastic about the support he receives from mountain bikers during organized trail days, and appreciates the reports he gets from mountain bikers pertaining to trail conditions (trees down, etc.) in outlying areas of the park that neither he, nor most hikers, frequent. As the park expands and more shared-use trails are being constructed which will permit mountain bike access, Mick hopes that the volunteer efforts on the part of mountain bikers and ALL trail users will continue to grow. To date Mick has had few conflicts with the variety of users at the Park, as the hikers are often attracted to the "mountain" side of the park, whereas the mountain bikers typically frequent the east side of the park. An incident with a biker, dog and hiker has encouraged Mick to enforce bikers with dogs to keep their four-legged companions on a short leash (4 ft. to be precise) at all times during their visit to the park. Expect to see signs to this effect and greater enforcement this year than in previous years. Mick's ability to develop the park with this focus on shared-use trails and access to mountain bikers has largely been the result of how his efforts have translated into attendance. Since 1994, attendance at the park has tripled. Since attendance at the park is predicated by gate revenues, it's important that all users pay the day use fee of $3 when they use the trails - (whether or not they park in either of the parking lots) - or secure a season pass from the Maine Department of Conservation which permits an individual access in all state parks for $30. The dedication of Bradbury Mountain State Park Manager Mick Rogers and his Ranger Assistant Bryan Kalleberg to the expansion of shared-use trails and mountain biker access to this park has made it one of the premier riding spots in Maine. With continued support from mountain bikers, the dedication of the Park staff will enhance the riding opportunities at this park long into the future, and make it a model for mountain bike access throughout the state. In February , the state announced that a $121,000 grant is going to the Bradbury Mountain State Park/Pineland Land Unit, for the connection between the state park in Pownal and the public land unit in New Gloucester. The new trail will include two bridges and trail improvements and will be available to the public for hiking, cross-country skiing, mountain biking and horseback riding. The full announcement is here (the amount is higher than the $103,000 shown in the article). Central Maine NEMBA is proud to be helping Mick and his staff create this Maine mecca, and if you'd like to get involved contact Maine NEMBA's president, Brian Alexander , or visit Central Maine NEMBA. In the meantime, support Maine Bureau of Parks & Land by purchasing a Loon licence plate and buy a season parking pass. You can always pay Mick a visit and thank him for his efforts. From Route 295 in Freeport head west on routes 125/136. Turn left on Durham Rd. And then right on Pownal Rd. which becomes Elmwood Road. After 4.2 miles turn right on route 9, Hallowell Rd. Go for 1/2 mile to park headquarters.